Jessica Biel’s Engagement Ring From Justin Timberlake – WOW! Jessica Biel’s engagement ring is an incredibly beautiful piece of Hollywood jewelry, featuring a large center diamond that appears to weigh in at approximately six carats. The side stones are aquamarine, which is Jessica’s birthstone. The halo surrounding the center diamond gives the ring a lovely vintage look, and the uniquely shaped shanks provide balance to the entire design. The story behind Jessica Biel’s engagement ring is a great one. Jessica and Justin enjoyed a leisurely four years of dating before Justin decided to pop the question, and because no one spotted her wearing a celebrity engagement ring worthy of her star status, the rumors started circulating. Some said Justin had given her a ring that wasn’t quite right, and the couple was looking for one that suited her better. Others said that perhaps prenuptial agreements were getting in the way. But the truth is that both Jessica and Justin enjoy their privacy. They’ve managed to keep mum about many of the details, however the proposal took place on a snowboard slope in Jackson, Wyoming. This is perfectly fitting, as the couple enjoys snowboarding and were first spotted together at Utah’s 2007 Sundance Film Festival, where they took a few runs together. Like Jessica Biel’s engagement ring, this custom engagement ring from Brilliance has a lovely vintage look, a spectacular halo, and even more gleaming diamonds embellishing the shanks. This diamond is a cushion-cut one, however an emerald cut, an Asscher cut, or radiant cut diamond would look equally stunning in a ring crafted using Jessica Biel’s engagement ring as inspiration. Born March 3 of 1982, Jessica Biel began her career in theatre, being cast as a vocalist in numerous musical productions. She first gained widespread fame when she starred as Mary Camden in the popular family drama TV series 7th Heaven, one of the WB channel’s most widely acclaimed shows and the longest-running family drama in TV history. Since her debut, Biel has appeared in numerous films, including The Texas Chainsaw Massacre, The Rules of Attraction, Blade: Trinity, I Now Pronounce You Chuck and Larry, Stealth, Total Recall, and The A-Team. She also had roles in The Illusionist, Home of the Brave, Powder Blue, Next, and a number of other productions. With such a massive body of work, it’s no surprise that Jessica Biel has been nominated for several awards and has won many more. The list includes Young Artist Awards, Saturn Award Best Actress, Newport Beach Film Festival, Teen Choice Awards, and others. Did you know that Jessica Biel co-founded the Make the Difference Network? Along with her father and a business partner, Kent McBride, she launched the charity in 2007. She has also climbed to the summit of Mount Kilimanjaro in an effort to increase awareness of the worldwide water crisis. These are just two examples of her many charitable endeavors. What Our Experts Have to Say about Jessica Biel’s Engagement Ring. 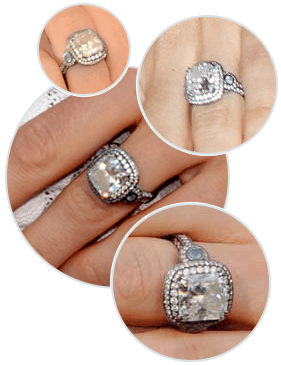 Jessica Biel’s engagement ring is an excellent example of a custom ring created with the wearer in mind. Chosen for her by husband Justin Timberlake, whom she says “has a great sense of style,” and designed by Leor Yerushalmi, it is one of a kind. The center diamond appears to weigh in at six carats or more, and blackened platinum scrolling rope details give it a vintage look with a modern twist. The ring is worth well over $100,000, however no one is certain what its selling price was. Vintage engagement rings are more popular now than ever before, and many couples are choosing designs that combine modern and vintage elements. Despite the intense creative work that goes into custom engagement rings like Jessica Biel’s, it is entirely possible to recreate the look for much less than the cost of the typical celebrity engagement ring! By working with Brilliance, you can either select one of the many gorgeous vintage-inspired designs we carry or come up with a look that reflects who you are. Whether you go with diamonds alone or decide to add a splash of color with your favorite side stones, you’ll love the sparkle that your own “celebrity engagement ring” brings into your life.